Cliffs retreat due to the combined actions of weathering, erosion and mass movement. As explained elsewhere, mechanical weathering, such as freeze-thaw, and chemical weathering, such as solution, can decay the rocks of a cliff in-situ, and wave cut notches can undercut the front of the cliff until the unsupported material finally collapses under the influence of gravity. The final collapse of the cliff is due to a process called Mass Movement. There are three types of mass movement to understand; Sliding, Slumping and Rockfalls. 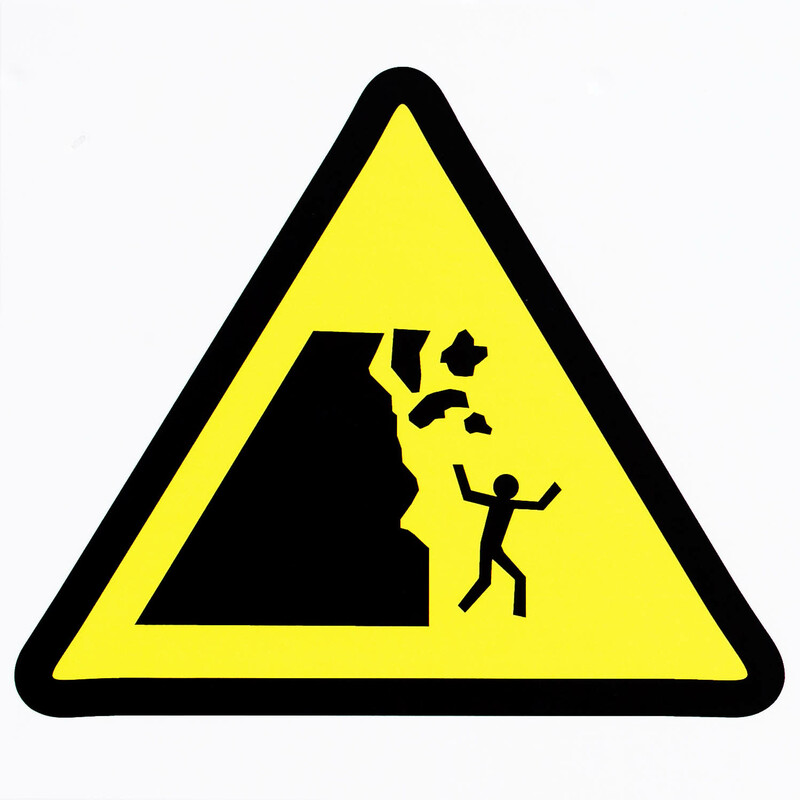 Rockfall is when material from the cliff falls vertically, or nearly vertically, down the cliff. For example, when a section is undercut by a wave-cut notch and suddenly collapses, the direction of the collapse is essentially vertical. Likewise, then rocks become loosened by heavy rain or erosion, and fall off the cliff face, they fall straight down it, collecting at the base. Rockfall then, is exactly that – falling rocks heading straight down the cliff. Sliding occurs when a section of cliff moves downwards AND forwards in a straight line. 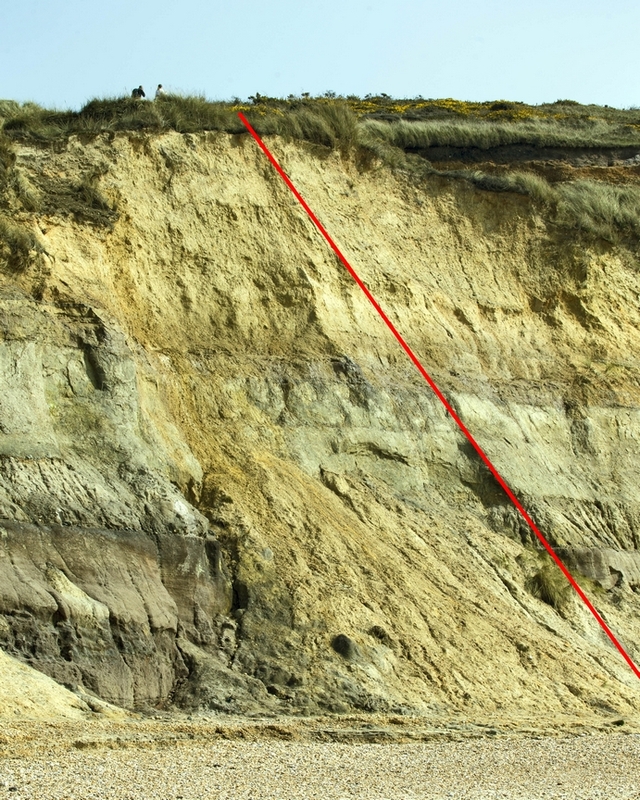 In the photograph the bedding naturally slopes toward the camera along the path indicated by the red line. 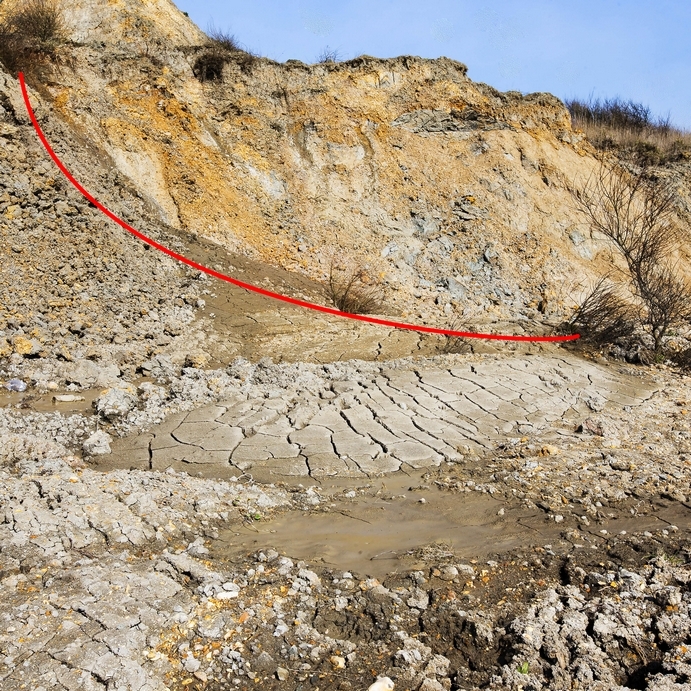 To the left of the line is an area that has experienced sliding in the last few days, the eroded section at the top of the cliff and the deposited debris at the base. because the fallen material has moved horizontally AND in a straight line, this is an example of mass movement by sliding. Slumping occurs when material moves along a curved path. The technical term is ‘rotation’ so slumping is also known as ‘rotational slip’ or ‘rotational slump’. In the photograph the path of the slump is highlighted by the red line. It occurs mainly in soft and uniform rocks such as silts and clays, and can be triggered by heavy rain. Coastal landslides of this type can move vast quantities of cliff material onto the beach, from where it is transporeted down the coast or out tosea.